Having dropped to an absolute 11-year low in January, the number of single-family homes and condos that traded hands across the greater Bay Area increased 12.9 percent in February to 4,354, which was an above-average seasonal jump but remains 12.8 percent below the sales volume at the same time last year and represents another 11-year low when adjusted for seasonality, according to recorded sales data from CoreLogic. In San Francisco, recorded sales totaled 303 last month, down 8.5 percent on a year-over-year basis and the lowest February count in ten years, which shouldn’t catch any plugged-in readers by surprise. 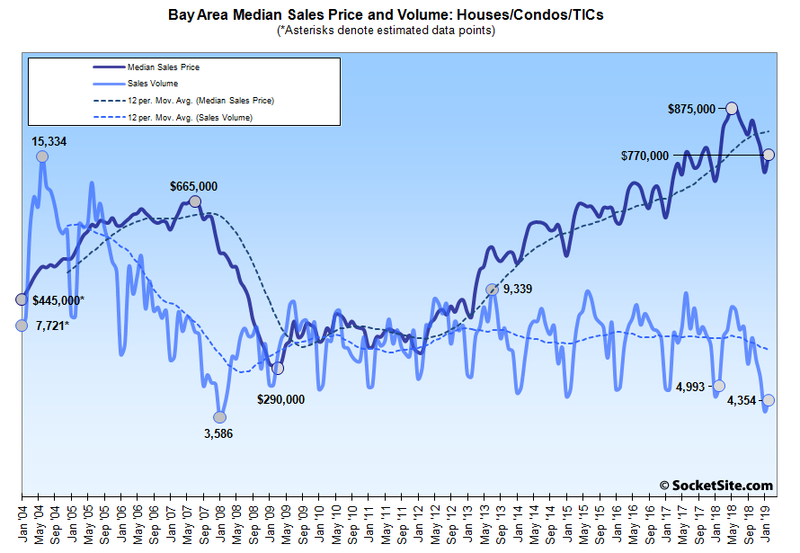 On the eastern side of the Bay, homes sales totaled 903 in Alameda County last month, down 10.4 percent on a year-over-year basis, sales in Contra Costa County totaled 851 (down 15.0 percent), and sales in Solano County totaled 359, down 21.1 percent versus the same time last year. Down south, home sales in Santa Clara County totaled 883 in February, down 19.2 percent on a year-over-year basis, while sales in San Mateo totaled 382, down 7.3 percent versus the same time last year. And up north, home sales in Napa totaled 79 last month, down 15.1 percent versus the same time last year, sales in Sonoma totaled 359, down 21.1 percent, and sales in Marin, which was the only Bay Area county to record a gain, totaled 180, up 7.1 percent, year-over-year. 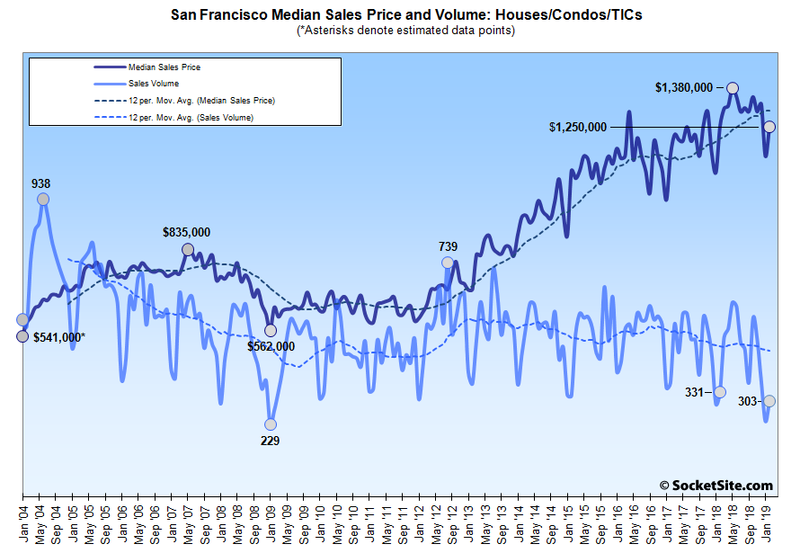 The median price paid for those aforementioned 303 homes in San Francisco was $1,250,000 in February, unchanged on a year-over-year basis and 9.4 percent below last year’s peak. The median sale price in Alameda County was $785,000 last month, 3.3 percent above its mark at the same time last year; the median sale price in Contra Costa County $595,000, 4.1 percent above its mark at the same time last year; and the median sale price in Solano County was $410,000, unchanged versus February 2018. The median sale price in Santa Clara County was $1,000,000 last month, down 7.4 percent versus the same time last year, while the median sale price in San Mateo County was $1,210,000, down 4.3 percent on a year-over-year basis. And with the aforementioned increase in volume, the median sale price in Marin was $1,025,000 last month, 15.7 percent above its mark at the time last year. But the median sale price in Napa ($590,000) was 1.7 percent below its mark at the same time last year and the median sale price in Sonoma ($540,000) was down 4.4 percent, year-over-year. As such, the median home sale price across the greater Bay Area ticked up 5.5 percent to $770,000 in February, which was the first month-over-month gain in four months. But the year-over-year gain, which has been on the decline since last May, slipped to 2.7 percent and the median price remains 12.0 percent below last year’s peak. And to recap, the median price in the three counties with the highest concentration of tech (San Francisco, San Mateo and Santa Clara) was either down or unchanged on a year-over-year basis last month. But as always, keep in mind that while movements in the median sale price are a great measure of what’s selling, they’re not necessarily a great measure of appreciation or changes in value and are susceptible to changes in mix, especially as sales volumes drop, as opposed to movements in the Case-Shiller Index. At the same time, an index for actual values, versus the “median sale price,” has been on the decline since the middle of last year, with the index for single-family homes having dropped 4.3 percent since the third quarter of 2018 and condo values down 5.7 percent since the second of the year. You may be right, but when you say “at the same time” here you are actually comparing two different months. Those are all lagging indicators for the stock market selloff last x-mas season. Dow Jones is up nearly 1000 points in last few days alone and going to hit a new record. Just to be clear, you’re suggesting that the inflection point last July was due to the stock market sell-off in December? Simple polynomials have “inflection points”. The output of a complex random process does not, and in this case the hidden state of the process is a mystery even to the Fed. the inflection “point” is “fuzzy”. If your whole chart-based argument is that the dark purple line will “catch down” to the light blue line like in 2008 I think you are wrong.